Summer feels like the perfect time to read an article about trends in women attending cultural events in person. From Lollapalooza to baseball season to the US Open, Summer was made for large-scale cultural events, and it feels like our social media feeds are filled with pictures, check-ins, and posts of friends and family who are enjoying themselves at these events. As part of the POPSUGAR Insights Content, Culture, and Commerce study, we surveyed over 1,500 women between the ages of 18-44 and asked them to tell us which cultural events they attended in person in the past year. 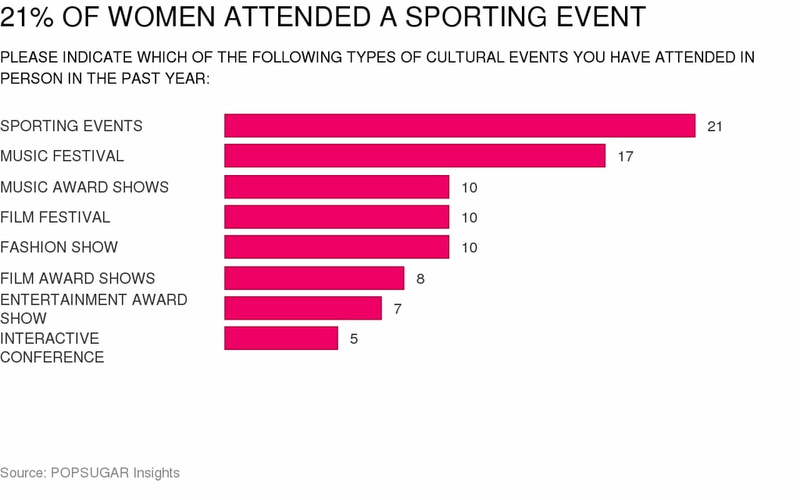 Overall, while 59% of women said that they did not attend a cultural event in person in the past year, of women who did attend, sporting events ranked number one overall, with 21% of women saying they've attended in the past 12 months. Music festivals ranked second overall, with 17.5% of women saying they've attended a music event in the past year. Ten percent of women have had the amazing experience of attending music award shows, a film festival, or a fashion show in the past year, and 8% of women had the incredible opportunity to attend a film award show like the Academy Awards or Golden Globes in the past year. Over 5% of women shared that they had attended an interactive conference like TED or South by Southwest in the past year.